Prince Harry has made a passionate plea for Britain to come out and support a London-based Paralympic-style championship for injured servicemen and women that he has launched. Prince Harry was speaking at the Copper Box at the London Olympic Arena yesterday to launch the Invictus Games. Through The Royal Foundation of The Duke and Duchess of Cambridge and Prince Harry, he has been instrumental in bringing the idea for the championship from America, where it is called the Warrior Games, to the UK after seeing the event staged in Colorado last year. The Games also received the backing of the Government with David Cameron describing it as a chance to pay tribute to the sacrifice of the UK’s wounded troops and Chancellor George Osborne announced £1 million from the Libor fund would be used to support the project. Defence Secretary Philip Hammond and London Mayor Boris Johnson attended the event’s launch. Prince Harry, a serving Army officer and keen supporter of the Armed Services, was dressed in fatigues and gave a short presentation before he later joined some of the wounded troops in a demonstration of seated volleyball. 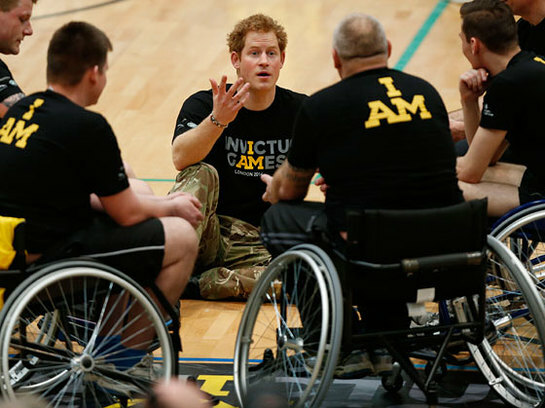 In an interview The Prince was asked how he would reach beyond Armed Forces families and attract ordinary people to the Invictus Games, Prince Harry replied: "Let the British public be the deciders of that. “The way over the last five or six years the British public has taken to supporting the British forces – the Paralympic Games as well – it’s not about supporting the conflict in Afghanistan, it’s not about supporting war, it’s not about supporting the Forces themselves, but come along show your support, look at the journey these guys have been through. Prince Harry added: "It’s not about winning or losing, the fact that the guys have got to this stage to be able to take part in these events, they’ve already won in my mind. Organisers said more than 300 wounded, injured and sick servicemen and women, serving and veteran, from 13 nations would compete in eight adaptive sports in London from 10th -14th September. On the programme will be athletics, archery, wheelchair basketball, road cycling, indoor rowing, wheelchair rugby, swimming, sitting volleyball and a driving challenge. Events will be staged in Queen Elizabeth Olympic Park with track and field events being held at the Lee Valley athletics centre. Countries taking part range from Afghanistan and Iraq to Germany, Italy and New Zealand. The Royal Foundation of the Duke and Duchess of Cambridge will contribute a significant grant to the staging of the Games. Supporting the Armed Services is one of the key areas of focus for The Royal Foundation. Prince Harry has taken part in a number of charity events and initiatives to support wounded and sick servicemen and women, including trekking to the South Pole.